We carefully select our tea from the best tea gardens around the world. Our Green Tea uses high quality leaves from the Camellia Sinensis, the same tea plant used for black teas. The only difference is how the leaves are treated after they've been picked. Our Natural Green Tea is a clean, refreshing green tea. Perfect anytime of the day. At Barry's Tea we know our tea. We've spent years perfecting our unique blends, passed down through four generations of our family. We've always listened to our loyal tea drinkers. 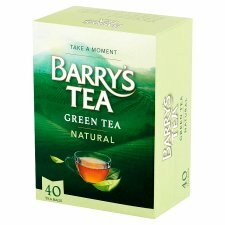 So as healthy lifestyles have become more of a priority, we've evolved our range to include a wonderful range of Green Teas, expertly blended especially for the Irish palate. Add almost boiling water and leave for 1 - 2 minutes.